Beata Krampikowski is a German artist from Schleswig-Holstein. She is originally from Poland and studied at the Parsons School of Design in New York. 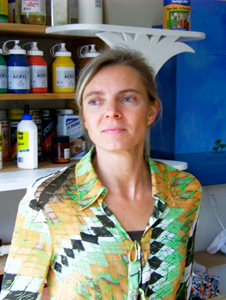 Professional since 2004, she exhibits in galleries and art exhibits in Northern Germany as well as her own showings. 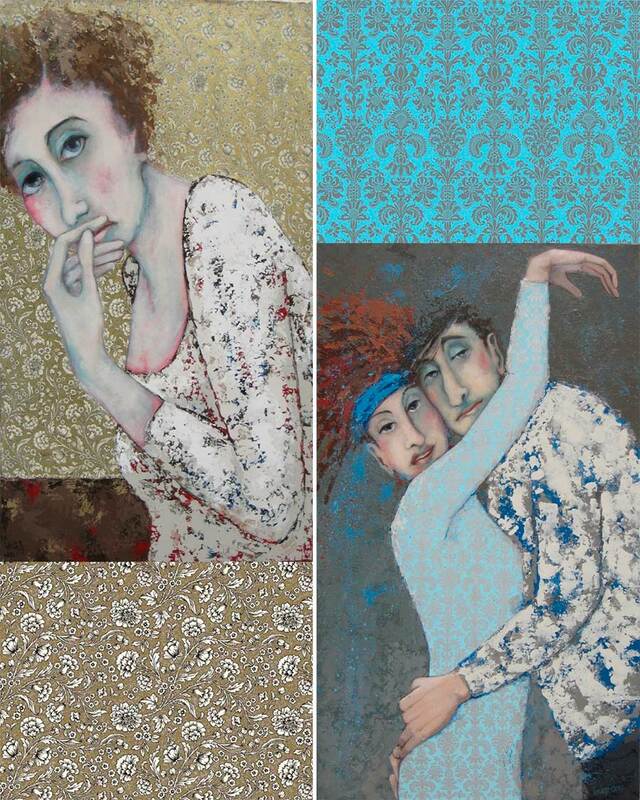 These Beata Krampikowski artworks are decorated with authentic Rossi Italian Paper known for its particular details and subtle nuances of “gold” powder (in the pictures: ref. TSC029 and CRT904). Lovers of her art say, “This is something I’ve never seen!” Her work is totally unexpected and idiosyncratic. This Schleswig-Holstein artist born in Poland, Beata Krampikowski studied design in New York and has gathered much attention with her “peep shows”. “People fall into situations that intrigue me, and so I put people in situations (on canvas) with which they must deal.” She observes how they deal with it, and freezes their behavior in a snapshot. 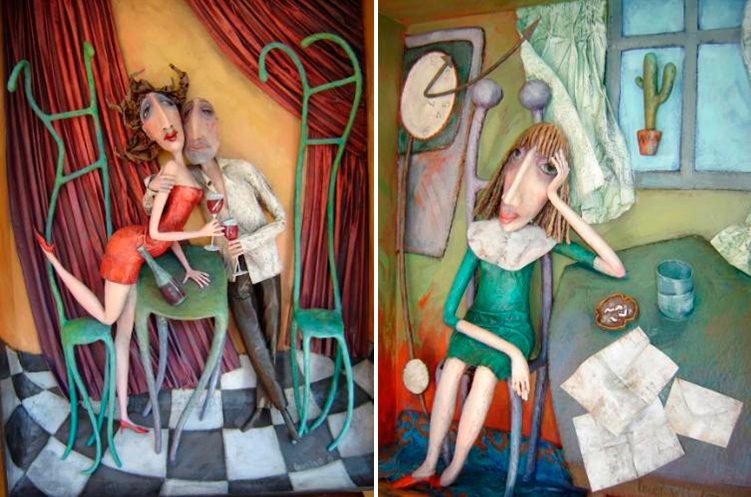 These works all are what she calls 3-dimensional paintings: kind of theater scenes in a box, some of them with doors to be opened to discover the motive behind, others have just glass window. The characters are done from papier maché. 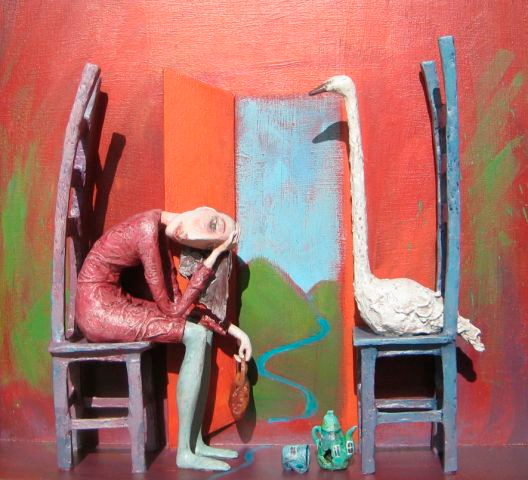 The scenarios in which she puts her characters are exaggerated, the figures grotesque and from time to time the entire scene, also a bit surrealistic. But one can always sense an abundance of humor….humor of the people, humor of the situation, and humor of the artist….. And a fascinating attention to detail. They remind one of the scenography of a puppet theatre where we like to be part of the play when we watch, but are also often happy to be just spectators. She is the wife of Frank Krampikowski of Da Capo entertainment, a German wholesaler to mainly the bookshop trade (museum gift shops, stationery stores, office supply etc.) who represents 56 different manufacturers (including Rossi1931) and suppliers.